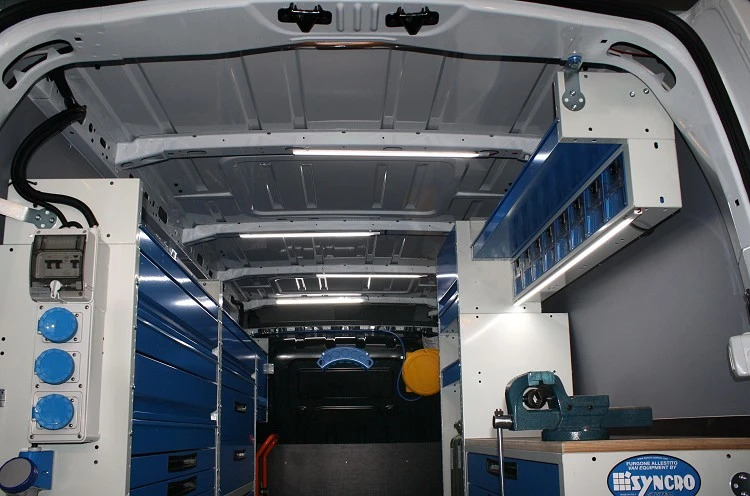 The modular van racking system developed by Syncro System not only optimises available space in any van load compartment, but also offers the chance to transform a simple van body into a genuine workshop on wheels, capable of transporting even bulky and heavy equipment and machinery in complete safety. 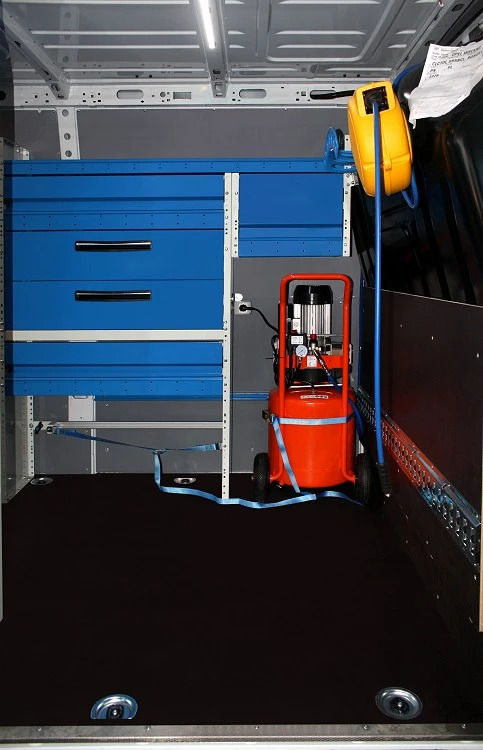 Installing Syncro van racking gives tangible advantages to all mobile professionals, and this is particularly true of fork life sale and hire companies which, in addition to delivering fork lifts to hire users and collecting them again, also offer their customers a mobile maintenance and repair service. Pallet transporters and fork lifts are in regular use in large factories, SMEs and warehouses, and on construction sites to lift and move heavy loads, crates, pallets and packaged goods. In fact, a fork lift is indispensable to most companies, not only because it speeds up daily operations but also because it makes heavy lifting much safer and much less labour intensive. It is little wonder so many companies use the services of specialist fork lift sale and hire firms. These firms also provide after-sales assistance and servicing whenever a fork lift requires scheduled maintenance or repair during the hire period. To deliver this kind of all-round service, fork lift sale and hire companies have to operate one or more vans with a load compartment large enough and well organised enough to allow their service teams to perform inspection, maintenance and repair work on site. 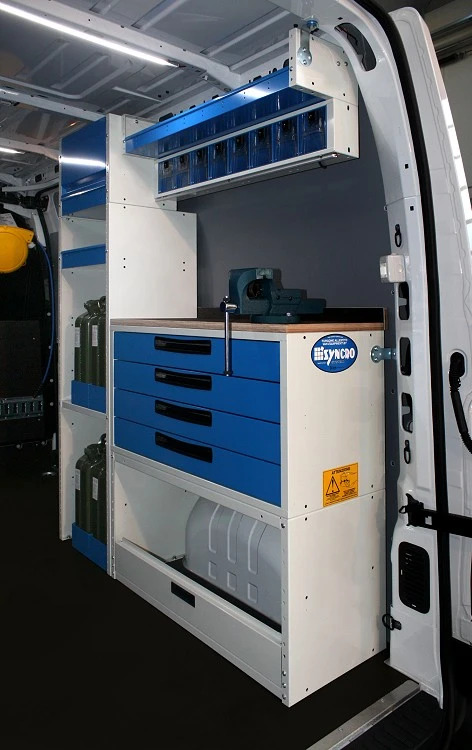 Syncro System, an Italian company with 20 years of experience in van racking, has conceived and developed a successful modular racking and storage system that can transform any van into a genuine workshop on wheels. 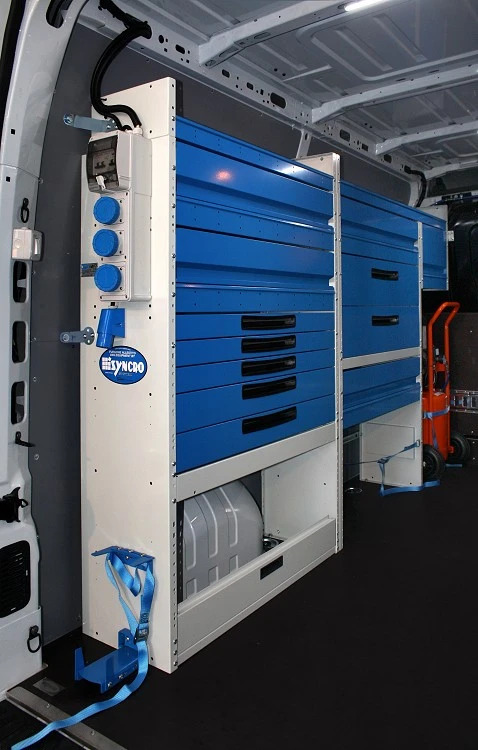 Syncro’s specialist installers can fit any van load compartment with customised racking according to customer needs. Syncro upfits include everything from floor coverings and wall linings to cargo lashing straps, storage units to carry materials and equipment, and accessories like handwash kits, lighting, access ramps and steps. Syncro System fitted out the van in the photos above for a company that sells and hires fork lifts. As is clear at first glance, the Syncro upfit has turned the van into a highly effective work space. This efficient mobile workshop is equipped with work tables and benches, shelves and drawers for storing tools and equipment and cargo rails with lashing straps for securing heavy loads during transport. First of all, the generous load compartment was reinforced with customised protective linings. The side walls, bulkhead and rear doors were lined with sheet metal panels to eliminate the risk of scratches and dents and to facilitate subsequent installation of the storage units. The floor was reinforced with a robust panel of non-slip, marine grade plywood. 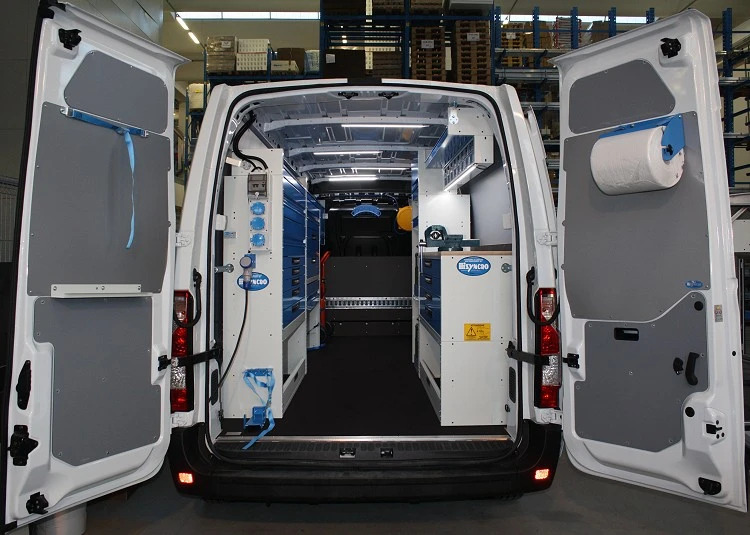 Once the interior was properly lined, Syncro’s installers began the job of assembling and fitting the racking as such, in this case along both sides of the van. On the left we can see two sections of storage made up of open wheel arch cabinets, drawer units and shelving units while on the right we find a unit of customised shelves for cans and canisters and a section consisting of an open wheel arch cabinet, a metal drawer unit and a marine grade plywood work bench complete with vice. Over the work area we can see a row of transparent drawers for small items and a metal shelf. This travelling workshop for servicing fork lifts also boasts an excellent lighting system and a series of practical accessories like a compressor, paper roll holder, electrical power sockets, extension cable, canister holder and highly effective hook and strap cargo lashing systems. Upfits of this kind can also be complemented with safe and silent roof transport systems, access ramps and loading steps and a large number of other accessories to make life easier for fork lift service technicians and all other mobile professionals. System designers and installers are on hand in all Syncro installation centres to prepare personal offers for custom upfits.